There were 153 yeas, 146 nays, and one MP who declared himself present. 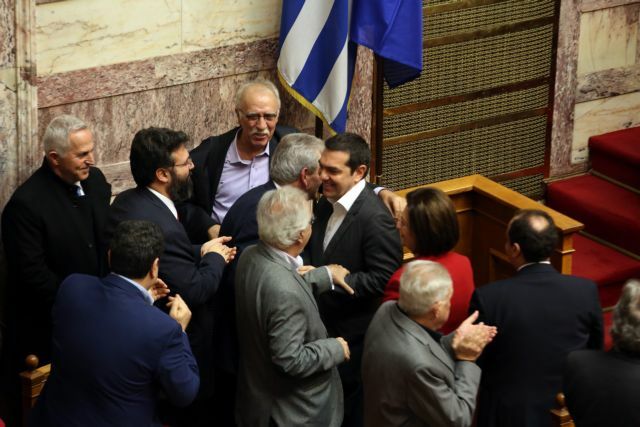 The 145 MPs of ruling SYRIZA were joined by eight independent MPs and some from smaller parties. The Greece-FYROM Prespa Agreement was ratified by the Greek Parliament this afternoon, putting an end to an intractable dispute between the two countries over the name Macedonia and the issues of language, culture, and identity that has bedeviled the two countries, the Balkans, and the international community for over a quarter century. The agreement re-names the country Republic of North Macedonia. The eight MPs that joined their SYRIZA colleagues were Democratic Left leader Thanasis Theocharopoulos, To Potami MPs Stavros Theodorakis (party President), Yorgos Mavrotas, and Spiros Lykoudis, Tourism Minister Elena Kountoura (formerly of the Independent Greeks), Deputy Citizen’s Protection Minister Katerina Papakosta (formerly of New Democracy), Independent Greeks MP Thanasis Papachristopoulos. Agriculture Minister Vasilis Kokkalis voted down the agreement. Grigoris Psarianos, who left To Potami before the ratification vote declared himself “present”. Prime Minister Alexis Tsipras hailed the result as opening a new page in Balkan history in a tweet immediately after the vote. “The hatred of nationalisms, conflicts, and clashes are giving way to friendship, peace, and cooperation. The future generations will owe a debt of gratitude to the MPs who boldly and courageously laid the foundations for a future of peace, solidarity, and harmonious co-existence between the two peoples,” the PM stated. “North Macedonia, which was born today, will be a friend. It will be an ally and supporter of Greece in efforts to ensure security, stability, andco-development in the region,” he added.